I’m going to state right off the bat that, as I’m sitting down to write this, I don’t have a proper title yet for this post. Which is rare for me, since I usually have an idea for the main theme of every post (even when it’s not just as straight-forward as “Review of…”) and always type in the title before I do anything else. If you’re reading this, I obviously must have settled on something eventually, but suffice it to say that things might get a little philosophical – more so than scientific, thought there is a little of that too – and I’m just hoping I can string this line of reasoning together. And then give my thinking-out-loud-in-writing an appropriate name. Randomness ahead; you’ve been warned! Let’s start at the top. Or rather, the starting point of this particular line of though: Matt’s new public life. One thing I wanted to return to after my Daredevil #4 review (before I found myself drowning in work) were some of the consequences of Matt’s recent decision to come out of the superhero closet, once and for all. 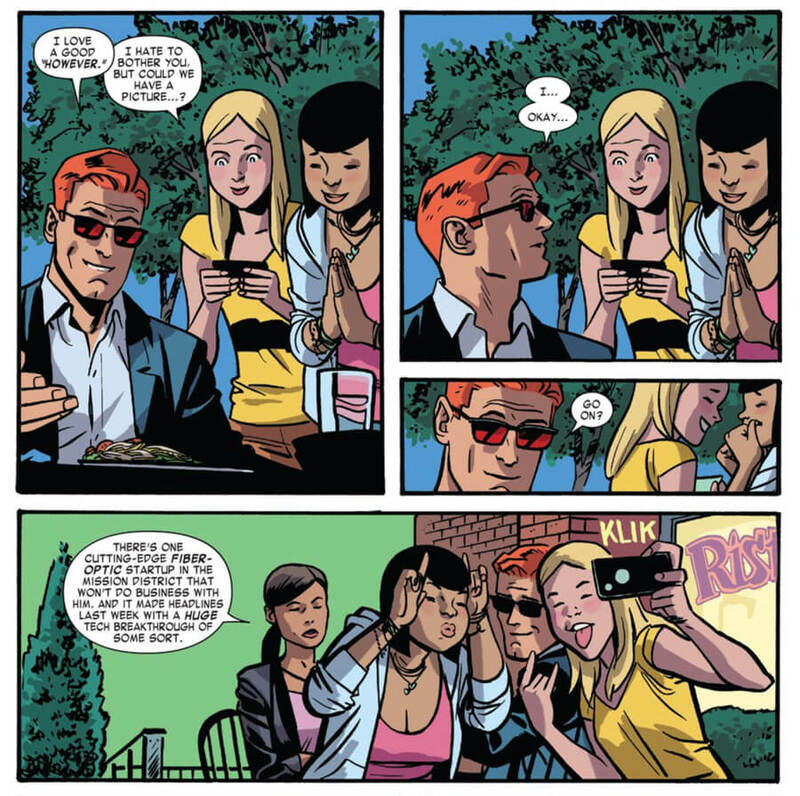 In Daredevil #4, we saw Matt and Kirsten draw stares from curious onlookers on their date, and Matt was even asked by two teenage girls if they could take a picture with him. On the next page, he has his picture taken by a paparazzo. Instant fame is an obvious consequence of the new status quo (even though Matt Murdock would have been a reasonably well-known local celebrity in his own right for years, back in New York), and in the scene below, you can almost hear the gears turning in his head as he wraps his brain around the demands of the Instagram era while trying to be a good sport. There are things that are more threatening than teenage girls and ending up in the gossip columns, however, and we get a riveting taste of that in Daredevil #5. And of course, the threat to the hero himself and the people in his life (because supervillains are generally insane and incredibly vindictive by design) is the most obvious consequence at the top of everyone’s list when a superhero exposes himself. It’s the main reason these characters bother to keep a secret identity in the first place. With Matt Murdock/Daredevil there are other interesting things that are exposed, which I touched on in this recent post, namely: With the final decisive outing, his peculiar physiology also becomes common knowledge. At least to a certain extent. While his medical history may be floating around (though not likely as a matter of public record), I doubt he’s ever had an audiogram made describing the extent of his super-hearing, and – apologies to Brian Michael Bendis – the notion that someone, unbeknownst to Matt, has measured the extent of his radar sense seems a little flaky. What is known, however, is that the famous protector of Hell’s Kitchen is indeed blind, and that he has a set of other abilities that allows him to be a superhero. Okay, so the cane is his billy club (I’ll return to that below), but that’s not really what I mean. The cane – along with the dark glasses, the head of red hair and a nice-looking business suit – is what makes Matt Murdock recognizable as Matt Murdock to someone who might pull a random issue of a Marvel comic off the rack and flip through it. It also reminds potential new readers who may know very little about the character, or even the Marvel Universe in general, that this is a blind character. While the heightened remaining senses complicate matters, this is no less true than it was before Matt’s courtroom confession. And, since people in general seem to have a hard time making sense of even real life people who fall in between categories (i.e. are hard of hearing or have low vision, as opposed to being totally deaf or blind), keeping the cane in the comic may be necessary to get the whole “blind superhero” point across. The most obvious in-story reason for Matt being so attached to his cane is that it’s obviously also his billy club in disguise. And since he could be called upon to perform his Daredevil duties at any time (and in fact appears to always wear his costume underneath his civilian clothes), the billy club needs to come along for the ride. On the other hand, he could easily keep it concealed and strapped to his body the way he does in costume. One has to wonder what the police might think of his carrying a bludgeoning tool around (though I suppose there are no laws against it), but it’s hard to argue with his right to carry a white cane. In many states, it is illegal for someone who doesn’t have a visual impairment to carry a white cane (though if you own one for the sole reason of cosplaying as Matt Murdock, you don’t have to worry), but Matt certainly has every right to it. A person obviously doesn’t have to be totally blind to use a white cane, and there are points to using a cane aside from making sure the user doesn’t step into a manhole or get himself in serious trouble. Canes used by blind people have a particular look to them for a reason, and that is to signal to other people that the person carrying them has limited (or no) vision. White cane users have the right of way in traffic situations, for instance. And, in the case of someone like Matt, it probably takes a lot of explaining out of situations like asking the person next to him at a bus stop which particular bus is approaching, or stopping someone on the street to double-check an unfamiliar address (to name just a couple of situations that his heightened senses don’t really cover). Even with Matt’s recent fame, far from everyone would know who he is. You will always find plenty of people who can’t identify a photo of the president. Or Lindsey Lohan. 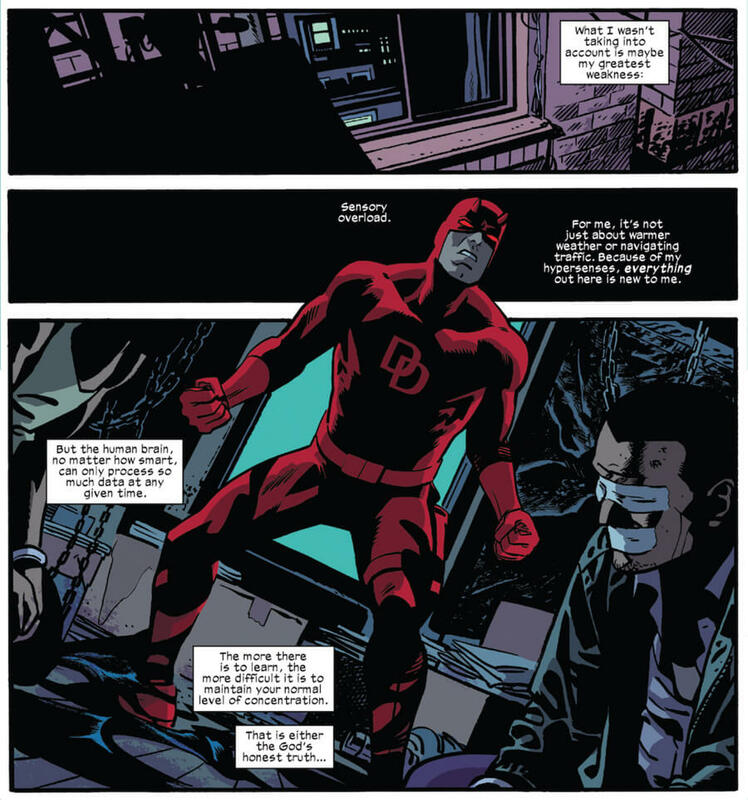 Another thing that would actually be useful to the normally crowd-averse Daredevil is that people tend to step to the side if they spot someone with a a white cane. Being able to clear a path to give himself some space during rush hour is something I’d imagine would make it easier for him to concentrate on other things happening around him, and not feel like he’s drowning in heartbeats or offensive body odors. And who really wants to drown in offensive body odors? There has been no dearth of situations that have been known to mess with Matt’s senses, the radar sense in particular, over the last fifty years. I already mentioned crowds, and another well-known complications writers like to throw at Daredevil is excessive noise. Then there’s pain, the common cold, and a long list of other major and minor threats to Matt’s ability to use his senses fully. Interestingly, except for big battle scenes like the one we saw Daredevil engage in – and complain about – in Daredevil #6, it almost seems easier for Matt to avoid general commotion in his Daredevil guise. After all, he prefers to operate at night, away from the streets and when he’s up against a dozen goons, he at least knows they’re all bad guys, and doesn’t have to make an extra effort distinguishing one from the other. Allowing for the highly probable scenario that occasional disorientation or general radar crap-out is as much a part of civilian Matt Murdock’s life, the cane might actually be legitimately useful every now and then. I’m not suggesting he can’t safely walk past an active construction site in pouring rain, but I don’t think it’s a stretch to imagine that doing so might require an extra dose of concentration that he would rather spend elsewhere. In fact, one nice thing about the cane generally is that it might allow a more sensible allocation of attention. Maybe he’s concentrating very closely on someone suspicious behind him, and not having to “look” where he’s going actually makes that easier. This will bring me back to a more fundamental point about Matt Murdock’s sensory world that I wanted to make (this list is by no means the main feature of this post, I warned you it would be a meandering mess). Anyway, in Daredevil #5, when the upgraded Leap-Frog suddenly pops out of the water, Matt calls out to Foggy to “Be my eyes!” This might strike some readers as weird. 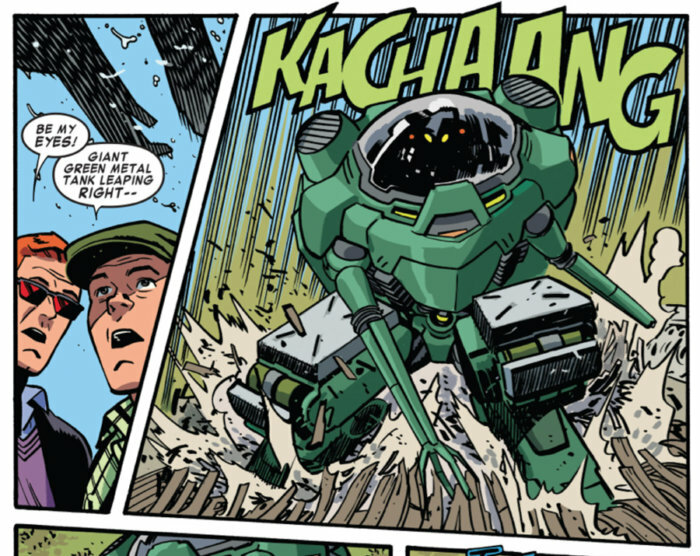 After all, Matt “saw” this one coming before Foggy did, before the big robot had even surfaced, and we would expect him to have a pretty good sense of the massive thing in front of him. Or would he? One thing that the creators manage to capture here is that Matt may not be spectacular at actually recognizing what he’s “seeing” when that something is either completely novel or has an ambiguous shape. I’ll get back to the details when I’m done with this list; for now, let’s just agree that the world is full of ambiguous shapes. Matt doesn’t have access to any real color or texture information and the radar sense does not have the same ability to discern fine detail as vision does, even when controlling for the absence of color vision. This would logically drive Matt to rely on touch more than the average person in order to learn more about an object. In this kind of scenario, the white cane can be an extension of the hand. Not necessary to avoid random object on the street, but possibly helpful in learning at least something more about it. He could even pair it with his sense of hearing. A light tap against a big garbage can, and he might learn whether it’s empty or not. The pavement changing texture (though this can also to some extent be felt underfoot), might be an interesting piece of sensory information to associate with a particular location. It would be like just another device for gathering information that might otherwise, literally, be out of reach. Is this information strictly necessary then? Probably not. But for a character who is all about attention to detail, and being in tune with his surroundings, one can at least see the psychological satisfaction this might bring to someone so naturally meticulous. As evidenced by that scene from Daredevil #5 I’ve already mentioned, one thing Matt is likely to fail miserably at is to size things up with a “glance,” they way sighted people do. Note, I didn’t say size up situations. That’s something our hero is obviously quite adept at, often noticing things beyond the realm of the average senses (although this too would depend on the circumstances). When I say things, I mean just that: static objects. It naturally follows that removing a number of features of all the objects around us, leaving only shape (and possibly some sense of differences in density), would greatly interfere with this ability to make snap judgements about unfamiliar objects, or objects that cannot be discerned based on shape alone. Daredevil obviously has access to sound and scent information (and touch, if he’s in a position to touch the object), but not all objects can easily be identified by sound and scent alone. And, to make a sound, an object has to be in motion. Before you start thinking that I’m suggesting that Daredevil makes for a pretty crappy superhero, I can assure you that’s not the case. Quite the contrary. As is so very typical of this unique character, what he lacks in one domain, may exist in abundance in another. The way I see it, it makes sense that Matt would be highly sensitive to the motion of objects. Vibrating objects make sound, but objects moving across a scene may also stand out more clearly to him. Research on visual processing has arrived at fairly well-established hypothesis that the brain deals with “what” and “where” information separately, along different processing streams (this logic may apply to other senses as well). Since the radar sense, whatever it is, functions in ways that are analogous, at least in some respects, to vision, it makes sense that the Matt’s brain would handle this information as “vision-like” (and hey, he’s a fictional character, so we’re free to speculate), and process much of it in visual areas of the brain. While the “what” areas of Matt’s brain have relatively less to work with than in the average person, the areas which handle “where” information might be able to become more prominent. It’s easy to see why quick reflexes combined with being especially attuned to even slightly movement anywhere in an over-sized “visual” field would be extremely useful for someone whose hobby is fighting supervillains. Loving posts like this. Again, because they’re not only interesting and informative, but because 1) it helps me with my fanfic (and I did use something similar in a recent chapter, but it was based off of info you’d posted here) and 2) It gives me something to say back to the folks on Tom Brevoort’s tumblr who claim that Matt isn’t “really” disabled because his other senses work so well (and therefore it’s insulting to actual blind people). Just out of curiosity, what answers does Tom Brevoort give to those who claim that Daredevil isn’t disabled? Re: Daredevil. It’s not an issue of him having abilities a normal person does not (as in your Spidey example) its that the abilities he has directly negate the challenges and obstacles faced by people who are blind. A better example would be Oracle being given the ability to walk via an incantation or some other power. It’s using the power to cancel out the disability, so you get points for having a disabled character without any of the nuance or depth of actually portraying them as such. Send all of your complaints to Stan Lee c/o 1964. It’s seemed to work out all right over all these years, though. He’s blind, but he can see what a normal person can except for what’s on TV screens. He can ‘see’ what is in front of him, ‘see’ when to walk and when to stop at traffic lights, ‘see’ where his food is relative to his cutlery, etc. He can even read – the only issue is screens, and colours (and even then he can ‘feel’ differences in materials; it’s disingenuous to say he is as blind as a typical blind person. This is virtually like complaining that it’s unfair to call Spider-Man a human being because he can stick to walls. Daredevil is a super hero. Therefore, he has certain abilities that ordinary people do not possess. It’s baked right into the concept. Considering that Daredevil can do more with his senses than regular people, isn’t it a little offensive that he pretends to be handicapped? He is technically blind, but he’s not really disadvantaged by it. Is it really possible to be “technically blind”? No way to know if the questions are all by the same anonymous poster, or whether it’s a couple more jumping on the same bandwagon. @Ellen: I just wish that Brevoort actually had better answers! It’s like he’s not even trying. To me, this topic has always been so exasperating to think about. I don’t understand how you can run a Daredevil simulation in your head and not arrive at the conclusion that his senses don’t cover everything. In fact, they don’t even come close. We’ve seen quite a few examples in Waid’s run, but that’s just skimming the surface, since the comic generally doesn’t cover things like “Matt goes shopping for a new sweater” or “Matt tries to make an online reservation”. I guess the problem is that these people don’t ever bother running that simulation. I also think that too many people jump from “he’s not like other blind people” (true) to “therefore he has no functional deficit at all” (untrue). Really, why is this so hard? Argh! I tried replying to a couple in the comments on Brevoort’s tumblr, but since those questions were anonymous, I believe that Brevoort gets my answers (since his post is a c/p of the question plus his answer), but the one who actually posed it only sees it if they’re reading Brevoort’s tumblr and view comments. Ah well. Having had a few blind cowrokers, and having some (relatively minor) visual issues myself I have to say this is too simplistic. First of all, a lot of blind people aren’t totally blind. One blind woman I worked with had normal perception of color and motion but it was all blurs, her vision was perpetually completely out of focus. So she could easily shop for and color-coordinate her clothing but couldn’t read anything but braille. In some circumstances she could use what vision she had to help her navigate – for example, the brighter light of a doorway to the outside world was apparent to her, as would be the darkened area of a unlighted closet with an open door. It would be disingenuous to say she wasn’t really handicapped, she most certainly was, even if she wasn’t totally blind. That’s why “visually impaired can be a more accurate description than “blind”, which carries a certain cultural baggage. Matt Murdock is her opposite – he sees no color, but can perceive form. But there’s no way in heck he’d be able to drive a car, at least not one with an intact windshield. He can’t see traffic lights or any sort of warning light. Sure, he can read many printed things but he has to be able to touch them – so he can’t read street signs. It’s also probably easier for him to read braille than feel faint ink impressions. He can’t use a GPS on a smartphone. There are a lot of clockfaces he can’t see. There are a lot of visual things you and I do every day he can not do. So yes, he IS visually impaired and he IS handicapped, just not as much as people might assume from hearing “Matt Murdock is blind”. Blindness is a spectrum, not a binary condition. Matt Murdock is handicapped, he’s not pretending. The fact he is not much disadvantaged by his disability does not negate the fact his eyes do not work and that does make him different from the sighted population. At times it is a true disadvantage. @Broomstick: Thank you! You echo all the same points I usually bring up (see, for instance Countdown to Marvel’s Daredevil: Blindness and heightened senses, Daredevil really is blind, “For Dummies”, and “My other senses more than compensate”. Actually, there are many jurisdictions in the US where a “bludgeoning tool” like a billy club is illegal for a civilian to carry, even more so to carry one as a concealed weapon. On the other hand, carrying around something for some other primary purpose that can just happen to be used as an improvised weapon is legal. Thus, the popularity of large flashlights like the D-cell Mag-Lite that also makes a very serviceable club for some people and situations. Matt is able to carry a white cane to a lot more situations than an item that is a dedicated billy club and nothing else. US weapon laws can be quite byzantine, varying across political boundaries but Marvel superheros seem able to ignore this, just as they are almost never prosecuted or sued for their actions or get in trouble for trespassing while running across rooftops or swinging off facades via grappling hook, webbing, or other devices, nor do they seem subject to airspace regulations while flying about (although the first Iron Man movie does have Jarvis mention it before a test flight). The Marvel universe is clearly a related but different reality.